Silverthin Bearing Group, a leader in manufacturing of thin section bearings and slewing ring turntable bearings, announces an expansion of their distribution agreement with IDC-USA to offer slewing ring bearings in addition to thin section bearings for North American markets. Silverthin and IDC-USA announced their initial distribution partnership in the summer of 2010. As the business agreement and positive market service has expanded, the product offer has expanded as well. Silverthin Thin Section Bearings are manufactured in the United States and designed for the aerospace, industrial, robotics and distributor markets. These thin section bearings are available in standard configurations, sealed and unsealed, and are engineered up to 40 inches in diameter. Silverthin slewing rings are domestically and internationally manufactured to offer a complete product selection for North American markets in sizes from a few inches to 25 foot diameter. "As a part of our strategic plan, one of IDC-USA's goals is to provide an ever-expanding array of new products and services for IDC Distributors. 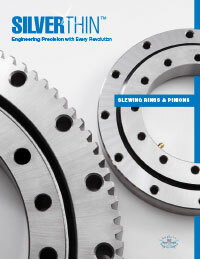 Silverthin offers a quality domestic product and delivers exceptional service in the market for our IDC Distributors. 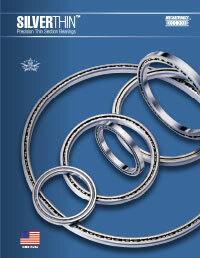 Their expanded slewing ring offering keeps IDC-USA on track with this goal!" comments Todd Carroll, vice president of IDC-USA. "We're very excited to expand our partnership with IDC-USA by offering our complete product line of domestic thin section bearings as well as a total slewing ring package. We are pleased this expansion provides greater product breadth for this elite group of independent distributors," notes Scott Eiss, national sales manager for Silverthin. Established in 1988, IDC-USA is a distributor-owned purchasing and national marketing cooperative made up of independent distributors in the bearing, power transmission and related industries. The cooperative currently consists of over 270 independent distributor branches located in 41 states and has $1 billion in annual sales, IDC-USA's Distribution Center, IDC University and Corporate Offices are headquartered in Indianapolis, Indiana.